Organizations all around the world are asking themselves how to build a data culture within their walls. Of course, this means something different for each of them. However, I want to introduce you to my process for answering that question. I rely heavily on Beth Kanter’s amazing work in this space, specifically her book Measuring the Networked Nonprofit (co-written with KD Paine). There are three guiding questions you can use to lead you through this process. I’ll go into each one in detail in this blog post. What is a data culture? What is our existing data culture? 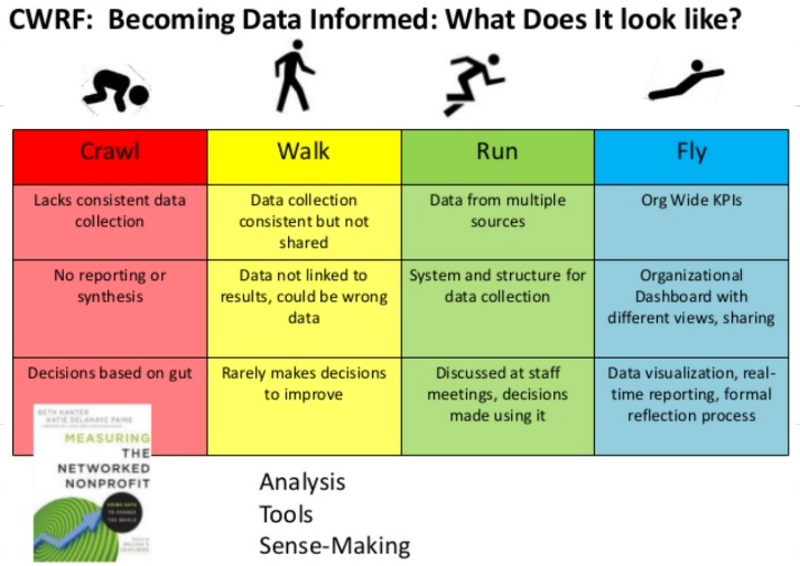 How do we build a data culture? First off, it is important to define what a data culture means to you. We toss around a lot of phrases to tease that out, so I find these little comics illustrative of the differences between some of these labels. Sure, these are kind of caricatures of those terms, but they’re helpful. As with most things, I like Beth Kanter’s description of some of these differences. Not surprisingly, I agree with her and advocate that organizations take a data-informed approach. Are there data champions already using data in good ways that you can celebrate as models to duplicate? Are the roles in your organization aligned with your data needs? Is there a central person setting policies and best practices when it comes to your data-related work? Do you have a data group? A Chief Data Officer? A Data Scientist? Or are those labels too much for your small organization? Who owns the data being collected, and do they have incentives to share it across the organization? Changing the internal culture of any organization is slow work. Beth’s crawl-walk-run-fly model (borrowing from the MLK quote) is a fantastic approach to this. Seriously, just go buy and read the book already. Of course, there are dangers and barriers you will have to overcome. First off, remember that people tend to measure what is easy to measure, not necessarily what is important to measure. The way to overcome this is to create a critical data culture that constantly asks questions like “what does this data help us do?” and “what is missing from this data?”. Another common barrier is organizational fiefdoms that don’t want to share their data with other. You can respond to this by incentivizing sharing of data and highlighting examples that do. There will be other challenges on your path to building a data culture, but remember your goal. Data-informed decision making and communication has already emerged as a key skill you need to have to help you create the change you want to make. You need to build a data culture within your organization to advance your work. I hope these tips help!